Low maintenance, econimical 10kw generator. Petrol generator that lasts long and provides a stable 9-10kw of power. Power Up has sourced a quite , economical to run and reliable generator which can be paired with your Power Up Complete Power System. The generator will provide 10KVA of power in 3 phase or single phase outlets . The “twin V” cylinders make the generator quieter than its competitors and it will run cool for an extended period whereas a single cylinder generator will need to be switched off to cool after a few hours and makes significantly more noise. 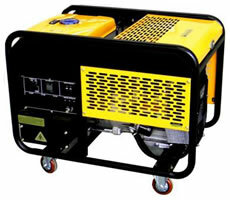 Power Up customers may purchase the generator at a preferential price.